The warm summer months are a time for your children to enjoy the outdoors. They may participate in summer camp, off-season athletic training, family hikes or days at the park with their friends. But while the warm weather is inviting, it also increases the risk of heat-related illnesses. Heat cramps. If the body loses too much salt through sweating, the muscles can become painful and spasm. This usually impacts the abdomen, legs and arms. Children with heat cramps should drink water in a cool, shaded area, and wait a few hours before becoming active again. Heat exhaustion. Symptoms include pale skin, headache, nausea, vomiting, irritability, light-headedness or confusion, weakness, profuse sweating, thirst and a rapid heartbeat. If symptoms do not improve after an hour of rest and rehydration, your child should see a doctor. Heat stroke. This is the most severe heat-related illness, marked by the body’s inability to regulate its core temperature. People suffering heat stroke may experience confusion, fainting, seizures, a very high body temperature and skin that is either overly sweaty or hot, red and dry. Call 911 in all cases of heat stroke, and keep the individual cool and rehydrated while waiting for the ambulance. Stay hydrated. Tell your child not to wait until he or she is thirsty to drink water. Instead, drink between 8 and 16 ounces of cool, hydrating liquid every hour. During physical activity, they will need four 8-ounce glasses of liquid per hour. Do not use sugary beverages – they may make your children more dehydrated. Remember, your children are losing salts and minerals as they sweat. If they sweat excessively, particularly during physical activity, they can replace any depleted salt and minerals by drinking sports drinks. Use sunscreen. Sunburns make your child’s body less able to cool itself. Make sure he or she applies sunscreen at least 30 minutes before going into the sun. Reapply after swimming or excess sweating. Wear appropriate clothing. Clothes should be lightweight, loose and light-colored. If your child is home for the summer, remind him or her to have fun indoors where there is air conditioning, such as in a movie theater, a mall, a community center, a library or a friend’s house. 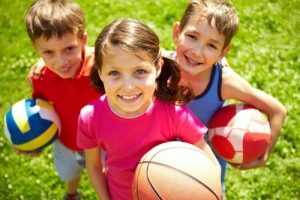 If your child must be outdoors for camp or sports practice, remember the tips above and make sure he or she spends as much time in the shade as possible. To help protect your children from heat-related illness this summer, make sure to follow these tips and teach your children the importance of regularly drinking water to prevent dehydration, even if they don’t feel thirsty at the moment.